A good bit of information for me would be (I found this while doing a google search on how to enable the mythical “roaming” feature mentioned in WRT54G manuals) exactly what settings you used to get the devices to talk to each other. Are the routers all connected by ethernet and simply act as a seamless WiFi blanket or do they repeat signal from each other? My goal is to have a completely wireless repeater device. 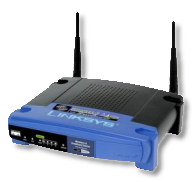 I have WRT54G with DD-WRT on it as my main router and I have several other devices (WRT54G, Edimax EW-7416APn V2, etc) that I would like to use as WiFi repeaters. For my home setup, all routers are connected via ethernet and provide a continuous Wi-Fi blanket, with each router on a different channel. I do, however, have a “portable” WRT54G running DD-WRT that I have configured as a wireless repeater, which I take with us when vacationing. I configure it to connect to the Wi-Fi wherever we’re staying, and then act as an AP for the Wi-Fi devices we bring with us. I bump up the TX/RX power to get better range, so it can reach the upstream Wi-Fi, as necessary.